April 25 is World Malaria Day, the day when all malaria prevention based organizations unite in the fight to end malaria. Ten years ago, Malaria was virtually unheard of. Now, it is taking front stage in the world of disease prevention organizations. In 2008, malaria claimed nearly one million lives worldwide. Approximately 3,000 deaths each day in Sub-Saharan Africa are due to malaria. 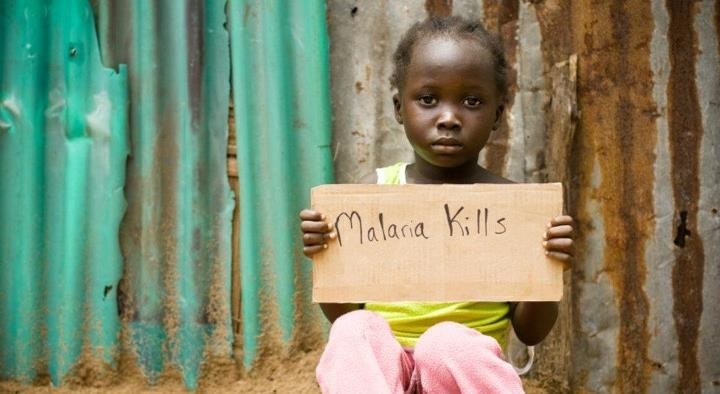 Still, most shocking of all, in 2008, it was recorded that a child died every 30 seconds due to malaria. Just to put things into perspective … 100 years ago, the world renown Titanic struck an iceberg and sank, killing just over 1,500 people. Malaria kills more people every year than breast cancer and prostate cancer combined. It has claimed more lives in the history of mankind than any other disease— including HIV. In Sub-Saharan Africa, it’s not cancer, losing a job or paying a mortgage that people fear. It’s much smaller than all of that. In fact, what they fear is roughly the size of a thumbtack. In Africa, it’s the faint hum of tiny wings that usher a “lethal injection” that people fear– the mosquito. Malaria is transmitted through the bite of an Anopheles mosquito. Immediately, the disease latches onto a blood cell. The mutation is rapid and has a multiplier effect until it has successfully weakened the body’s immune system. In a twist of tragedy and irony, malaria actually intensifies the effects and severity of other diseases such as tuberculosis, HIV and the flu. Although malaria is no longer an issue in the United States, nearly 40 percent of the world’s population is still in a malaria risk zone. The sad part is the countries where malaria is prevalent are all third-world countries. This means that these countries live on a typical daily budget of less than $2 per day. It also means that living conditions are destitute and that medical assistance is not readily accessible. Add all of this together and you have the perfect equation for a pandemic. During the summer of 2008, I was able to witness first-hand the effects of malaria. While on a trip to Uganda, I saw disease and sickness unlike anything I’ve ever seen. I witnessed life and death up-close-and-personal. I saw children, mothers and even entire families suffering from malaria. All the while I, the well-off foreigner, waltzed in with bug-spray, a mosquito net and anti-malaria medicine. I couldn’t escape it. I was broken by the simple fact that I had all the means to prevent malaria, yet I was the foreigner! Then I realized that things were even worse. The simple solution— a mosquito net— was right at the Ugandans’ fingertips but they couldn’t afford even one. Sadly, this is the case in the majority of Sub-Saharan Africa. In fact, less than 16 percent of households in Sub-Saharan Africa own even a single mosquito net. However, there is good news. Following my excursion in Uganda, I returned to the States with a new outlook on life. My heart was burdened for the people of Uganda. And so I began fundraising. With the enlisted teamwork of some close friends, we set out to raise $10,000 in one year. We succeeded. And, in less than a year’s time we were distributing just over 1,000 mosquito nets to villages in Uganda— villages that I had personally visited and witnessed the need. This was the beginning of what is now my full-fledge 501c3 called, Operation Net. To date, Operation Net has distributed over 4,000 mosquito nets– protecting over 16,000 lives from malaria. Operation Net is represented by three college clubs in the northeast region and has supporters nationwide. In 2011, Operation Net was honored to be a part of the global generation to witness a decrease to the number of deaths from malaria. Last year, the World Health Organization noted that the malaria-related mortality rates decreased by 20 percent in the last decade. This year on World Malaria Day, our goal is to distribute 1,500+ mosquito nets all at once, covering over 4,000 people. And this year, we are calling on you for support. Operation Net wants you to join in the fight against malaria. A single mosquito net costs under $10— less than a meal in New York City! The need is great and the solution is simple. Greg Pittman is a guest writer in the House of Bonhoeffer and the founder and president of Operation Net. For more information about Operation Net, visit www.operationnet.org.